Shared Use Paths create conflict and cause complaints about "speed"
Many countries build combined infrastructure for cyclists and pedestrians. Wherever these shared-use (aka multi-use) paths exist, there are complaints due to the conflicts which occur. Many of the complaints are from pedestrians who find the speed of cyclists unacceptable on paths which they use for walking. This is a wholly avoidable problem. The cyclists in the video above demonstrate well how most take extraordinary care around pedestrians. Every cyclist in the video has his or her journey made inconvenient by the presence of the pedestrians but they all slow down, even slowing so far as slowing to walking pace to climb an incline, a situation where cyclists naturally would like to keep their momentum as it requires less effort to climb without braking first. What you see in the video is quite typical behaviour for cyclists anywhere in the world when they encounter pedestrians, but taking care in this way isn't enough to stop there being complaints. Cyclists are still likely to be regarded as a problem because their behaviour is different to that of pedestrians. Cyclists appear to invade personal space around pedestrians, to "squeeze past", to wobble and to swerve in and out. Even when taking care, their behaviour seems aggressive and unpredictable to many pedestrians. Complaints about excessive speed of cyclists on shared paths are often a result of perception by pedestrians rather than being due to cyclists riding past pedestrians at genuinely high speeds. choose between "safe" on the path or "fast" on road. A few metres away from the bridge there are roads much like those in many countries on which motor vehicles routinely and legally travel at considerably higher speed than any cyclists in the video. Pedestrians rarely complain about excessive speed of motor vehicles on roads like this because those vehicles are driven on infrastructure segregated from pedestrians. Unless drivers leave the road and drive on the pavement (sidewalk), there is no invasion of pedestrian space and no close passing. Conflict between pedestrians and motorists is reduced by separating them. All countries seem to understand how to build roads to cope with the speeds of motor vehicles and also how to build separate infrastructure for pedestrians to reduce conflict. The benefit of giving different and incompatible modes of transport their own space and not expecting them to share are understood widely. Why is there a blind spot when it comes to cycling infrastructure ? The aim is the same. Cyclists are neither car drivers nor pedestrians and should not be treated as if they were identical to either of these other two groups. its size means that there is plenty of space for everyone. The requirements for cycling infrastructure are not even particularly difficult to meet. Even the fastest of cyclists make their journeys at a fraction of the speed which can be reached by a car and the much lower mass combined with that speed presents a fraction of the danger of motor vehicles. Cycle-paths do not need to be so wide as roads for cars and infrastructure such as bridges and tunnels do not need to cater for such large vehicles or large weights as equivalent infrastructure for motor vehicles. Where conflict between cyclists and pedestrians occurs, it is almost always due to cyclists being forced to use infrastructure which is not designed for them at all. Infrastructure on which cyclists and pedestrians are expected to share equally does not properly take the requirements of either group of users into account and creates conflict situations. An incident this week in London gave a good example of what happens where there is a pretense that pedestrian infrastructure can also be used by bicycle. Radio presenter Jeremy Vine was stopped by police for speeding when cycling. How did he come to be stopped ? He was exceeding a speed limit of just 5 mph (8 km/h) on a path through a London park. The police saw this as a high enough priority that police officers were in the park to stop errant cyclists. Despite considerably hype from the city, London is still a very difficult and dangerous place for cycling. Paths within parks in the city are well used by cyclists because they offer a rare opportunity for cyclists to make part of their journeys away from traffic. They also can offer relatively direct routes. Extremely low speeds might be acceptable for some cyclists making recreational trips but anyone trying to get somewhere at a speed competitive with other modes of transport needs to travel at more than jogging pace. 5 mph is much slower than a normal cycling speed. Almost anyone on a bicycle will exceed that speed without trying. It's clear that such a limit makes no sense for cyclists. There followed some debate about whether or not the law applies in this specific case, but that's not really the point. Whether or not it's legal to cycle here at above 5 mph, there's still a problem: Infrastructure in parks in London which supposedly allows cycling is not good enough to make for safe and convenient journeys at normal cycling speeds. The shared nature of paths like this is itself a very large part of the reason why there is conflict. Police were present to stop cyclists in this park because there have been complaints in the past due to previous conflicts. Trying to impose an extremely low speed limit on one of the slowest means of transport is not a solution to the problem. What needs to happen is that proper consideration is made of why conflict occurs and action taken to improve infrastructure to the point that the conflict is reduced. In a city there will almost always be too many pedestrians and cyclists to allow them to share paths without conflict. Shared-use paths don't make sense in crowded cities. The idea that "speeding cyclists" are a problem which needs addressing is not new. Low speed limits to control cyclists are also remarkably common. 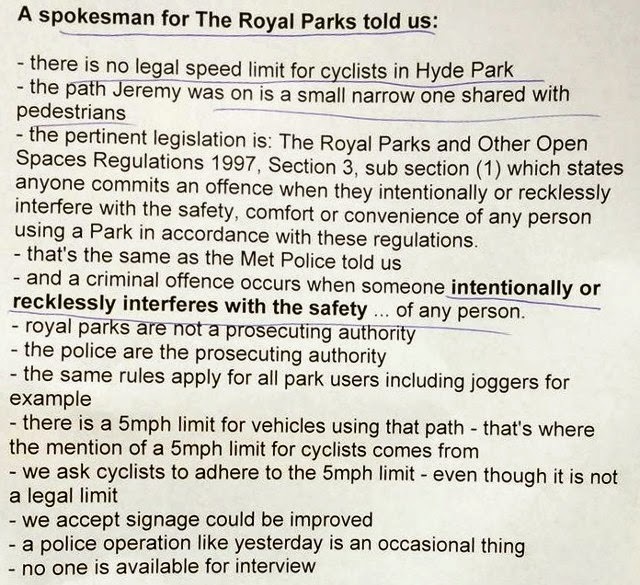 Glasgow, for instance, wanted a 5 mph limit like that in London "to ensure other parks users’ safety" while allowing motor vehicles to travel at twice the speed. San Francisco discussed a 10 mph limit for cyclists crossing the Golden Gate bridge (the speed limit for motorists is higher of course), Sydney has a 10 km/h "advisory" speed limit over a bridge. Christchurch is planning for 15 km/h on "major cycleways". The video from Sydney is worth watching. Note first that the bridge really is very wide. It could easily allow for normal cycling speeds if only there was a separate area marked for cyclists to reduce conflict (this should preferably look like a road as in the Assen photo above to reduce confusion). Also note that the fastest cyclist was travelling at just 23 km/h. 23 km/h is not fast at all for a regular cyclist. It's well within the range of normal speeds for cycling, a speed which in my experience is exceeded by many Dutch people on standard town bikes when going shopping. 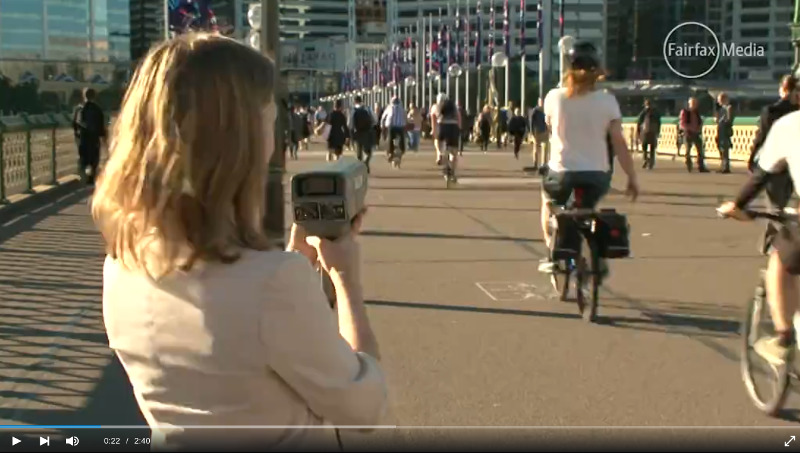 Participants on one of our study tours earlier this year may remember following a young student in Groningen who was applying her make-up while cycling at a consistent 27 km/h on a normal upright Dutch bike. I don't actually believe that speeds above 10 km/h are considered to be high speeds in Sydney except when the people under observation are cyclists. Perhaps Sydney residents can tell me whether there is any place at all within the city where drivers of cars are expected to observe a 10 km/h speed limit on one of their main through routes. Each year, there are more than 1.2 million deaths across the world due to crashes involving motor vehicles and tens of millions more people are injured. Cyclists and pedestrians are often the victims of such crashes. There are no similar figures for deaths and injuries due to cyclists because the scale of the problem is infinitesimally smaller. Despite this, it is cyclists who are emphasized as a risk. You may wonder where these attitudes come from. What type of organisations would support such a notion as that cyclists go "too fast" and cause danger when it's so clear that morgues and hospitals the world are full of the victims of motor vehicle crashes, not of bicycle crashes. quality design of those very same paths. Sustrans. For 'cycling' but against cyclists ? 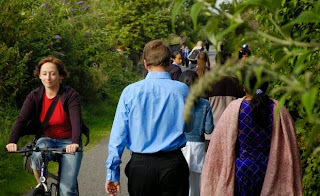 Sustrans is a British organisation which claims to be interested in "enabling people to choose healthier, cleaner and cheaper journeys" and which is behind the UK's "National Cycle Network". Unfortunately, in a scramble to be able to claim to have a large quantity of cycling facilities they long ago forgot about the importance of quality and as a result they are now in the position of defending inadequately designed shared-use paths which make up a significant proportion of their network. Many people, including myself, have criticised the inept designs of infrastructure which Sustrans still approves of, pointing out that they create conflict and danger. Sustrans' reaction to conflicts caused by the design of their infrastructure has been to publish a "code of conduct" for cyclists. 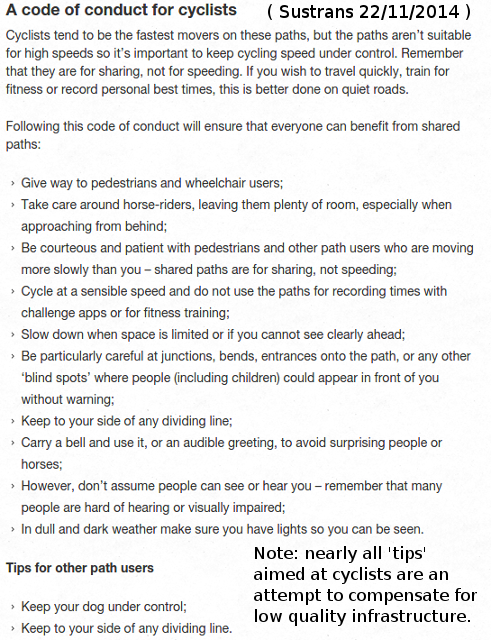 In their code of conduct, Sustrans point out themselves that their paths "aren’t suitable for high speeds" and suggest that "if you wish to travel quickly [...] this is better done on quiet roads". For all their claims about having provided a network of cycling infrastructure, they're actually admitting that this network is not suitable for cycling. All the emphasis is on cyclists being told to modify their behaviour except for just one clause each regarding dog walkers and pedestrians. 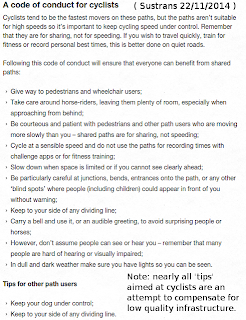 When not telling cyclists to go elsewhere than to ride on the cycling infrastructure, Sustrans tell them to "slow down", "be patient" or use a "sensible speed" in order to work around the needs of other path users. But what is a "sensible speed" for cycling ? That rather depends on one's perspective. If Sustrans were genuinely building routes for "SUStainable TRANSport" then these routes would be usable at normal cycling speeds. If Sustrans' National Cycle Network already truly met "the highest possible standards" then there would be no complaints, no reasons for Sustrans to tell cyclists to go elsewhere and no reason to impose limits. Cyclist speeds cannot compete with motor vehicle speeds. The speed of cyclists is naturally limited by the limited power available from a human body. The highest speeds achieved by cyclists are comparable with the lowest speed limits imposed on motor vehicles. Countries which have no difficulty in building an extensive network of roads on which motor vehicles travel at 50-120 km/h shouldn't have any difficulty at all in building cycle-paths which can cope with cycling speeds which on the flat are seldom consistently above 30 km/h and peak speeds rarely above 50 km/h. It's an absurdity for cycling infrastructure to be designed such that it is unable to cope with the relatively modest speeds which even fit cyclists achieve on their everyday journeys. guarantees that conflict will occur. Sadly, Sustrans representatives have been repeatedly vocal about cyclists being "a menace that needs taming". You might wonder how other cycling organisations in the UK reacted to an organisation which puts such a point of view and publishes a code of conflict which puts emphasis firmly on their members, fellow cyclists, as being a cause of trouble rather than pointing out that planners had done an inadequate job. Surprisingly, the answer is that many other organisations joined in. British Cycling gave its support and CTC endorsed the Sustrans code of conduct. What's more, spokespeople from CTC and Sustrans got together to ask other cyclists to pick on an "anti-social minority", requesting that people "take action by pointing the finger" at other riders. It seems they'd all rather encourage a minor form of vigilantism and create an out-group of cyclists to blame instead of addressing head-on the problem of inadequate infrastructure which causes the conflicts to occur. It's hardly a secret that Sustrans' shared use paths are inadequate as even the photos chosen by Sustrans to illustrate their network actually demonstrate the problems with it. 2016 update: Roger Geffen of Cycling UK (new name for CTC) replied to this blog post concerned about the "take action by pointing the finger" quote above. This suggestion was made by Sustrans' then chief executive. See his comment and my reply to him below. There's nothing wrong with building a network of meandering walking routes for people to enjoy by foot. But call it what it is. That's not how you create a network of convenient cycling routes which provide a realistic alternative to driving a car to make journeys. There's something very wrong indeed with pretending to have created cycling infrastructure or indeed an entire cycling network if actually cyclists are only welcome to use this network at a pace which makes cycling inconvenient. If your cycling infrastructure can't cope with the speed of bicycles then it's simply not of high enough quality. A bridge which divides instead of connecting is not a success. efficient grid of go-everywhere infrastructure. To encourage people to cycle, cycling must be fast. It is important that cycling journeys are made efficient and safe as otherwise cycling does not compete with other modes of transport. The Sustrans representative draws false equivalences with the Netherlands and Denmark as being places where people cycle slower, but it's simply not true. No-one has time to waste on inadequate infrastructure which slows them down. There is no demographic group in this country or any other which wants their journeys to take longer than they have to and no excuse whatsoever for building infrastructure which has that result. Infrastructure which requires cyclists and pedestrians to use the same paths can be acceptable where there will be almost no usage by one of the groups but it will always leads to conflicts in any place where numbers of users are high, especially when there are large numbers of pedestrians. Normal Dutch practice is to build cycle-paths without separate pedestrian paths between towns where distances are relatively large and there will be few pedestrians, but paths inside villages and towns should almost always have separate paths for pedestrians. This avoids the need to built a separate pedestrian path in places where there will be little if any conflict due to the low numbers of users, but also avoids conflict where we know there will be many users. The first video was made in Norway a few weeks back but the problems demonstrated by it are are common to anywhere that cyclists and pedestrians are forced to mix. Sadly, the main Dutch campaigning organisation has also fallen into the trap of campaigning against cyclists rather than concentrating on where real danger comes from. City centre streets. Perfect for children on their own bicycles, if the city is truly planned for cycling. Cargo bikes shouldn't be required. Something which people who visit Assen often notice is the lack of cargo-bikes. Somehow an expectation has grown up that cargo bikes are the way of transporting children by bicycle. Actually, children have their own legs and really should be able to use them to transport themselves as soon as they have the ability to ride a bicycle. This of course is only possible if the infrastructure is very very good, and over most of this city that is indeed the case. It wasn't always like this, but motor vehicles were removed from the centre several years ago and that left behind conditions where everyone is safe. All ages and abilities served by one type of infrastructure. The youngest daughter in this family rides on the front of Mum's bike while her slightly older sister rides her own bike. They're heading directly towards the city centre. Directly towards the same streets as shown in the following photos. It's not unusual to see children this young cycling to the city centre. A comprehensive grid of very high quality infrastructure makes this possible. The city centre streets are used by bicycle by people of all ages. The woman in the centre has more experience, but lots of experience isn't required to be safe here. The youngsters on the right are already able to make their way through the city without an adult to accompany them. Of course some children are accompanied by parents. These two are heading towards a large square in the middle of the city which was once a car-park. The youngest child sits on Dad's bike while her older sister rides her own bike. Young teenagers have complete independence. This group rode through together. Presumably the lessons for the day had ended. The light grey concrete on the left of the cyclists is textured to help blind people find their way. Paving like this is laid throughout the city centre. Another mother and son. The mother's bike has a fold down child-seat on the back, which is possibly used sometimes for a younger sibling. They're all moving in the same direction, but they're not all looking in the same direction. Cycling is very social in the city centre. People are always looking out for their friends and family. A lot of smiles, a lot of waves. More youngsters riding home from school together. The city centre streets make a good route to many locations. Teenagers attending secondary school (age 12 upwards) are likely to have further to travel. Eating while cycling and riding no hands. These are comparatively safe things to do when there are no cars on city centre streets. Mum indicates a right turn. The children also will turn up onto the forgiving sloped kerb . Teens again, riding sociably side by side. Very young children ride on the back of their parents' bikes. But those who cycle on their own bike are often also very young. Where have the cars gone ? traffic has been removed. The car park no longer exists. pedestrians to cross the "road" for bikes. The photos above show very typical views of the centre of Assen in 2014. Many other Dutch cities look similar. However, it wasn't always like this. In the 1970s, the number of children being killed on the roads reached a peak. Cycling was in decline in the Netherlands at that time. Assen, like other cities, was full of motor vehicles. Cars, buses and trucks dominated the city centre streets. Cyclists who remained on these streets were under pressure. The situation was much like that of many cities now. There was "no space for cycling infrastructure" and car parks were full. If Assen had continued on the path which the city was on, it's unlikely that people would cycle so much in the city as they do now. The problems in the centre of the city were turned around by a second revolution which returned old streets which pre-date motor vehicles to people rather than allowing the problems due to allowing motor vehicles to dominate them to grow. The city centre area is now a large pedestrian zone. What looks like a road in all the photos above (except the first one) is actually a stripe through the pedestrian zone on which cycling is permitted. This is a design which works very well because it is familiar. "Road" for bikes, "pavement" for pedestrians result in no clashes between cyclists and pedestrians within this pedestrianized area. Signage at each entrance to the pedestrian zone points out this status. 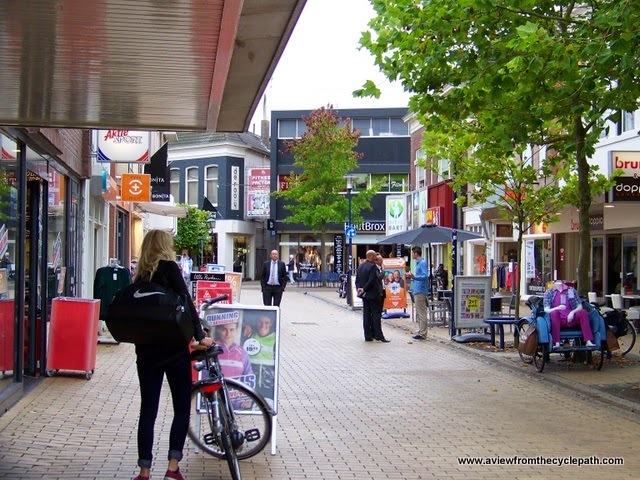 Cycling and walking are the most popular means of transport for shoppers in Assen and these are the modes which are best catered for in the city centre. Of course it's not just the city centre which has cycling infrastructure. An extensive and fine-grained grid of high quality infrastructure stretches across the entire city so that no-one has to cycle in conditions which are not subjectively safe. This is the only way of making cycling accessible to everyone. we wouldn't have needed it in Assen. In many places, people who didn't bother with a car before they had children find that they need one once they have children. Of course it is in many ways better if people switch to using cargo bikes to carry their children rather than using a car, however the experience of the children themselves is not so different if they're transported by a parent with a bicycle rather than being transported by a parent with a car. A high percentage of parents using cargo bikes to transport their children is better than having the same parents driving cars, but while a growing number of cargo bikes might indicate a growing confidence amongst parents it should be seen as a step in the right direction but not as an end in itself. reasons than to transport children. Why not cargo bikes ? So long as they're used for carrying cargo, there's nothing wrong with cargo-bikes at all. There's also nothing wrong with them for carrying small children. It is only when cargo bikes are seen as a solution for carrying children who are old enough to ride their own bikes (i.e. 4+) that this indicates a problem. The problem is not with the bikes or their riders but with the environment for cycling. If parents don't think that the local cycling infrastructure is sufficiently safe for their children to have control over their own movement then this indicates that the infrastructure is sub-standard. Children should have conditions safe enough that they can have control over their own movement and not have to rely upon their parents for lifts, either by bike or by car. Where the cycling infrastructure is very good, cargo bikes are relatively rare and mostly used for carrying cargo. It's better for parents and for children if children can be given the freedom to control their own movement. I'm not criticizing anyone for using a cargo bike to transport their children. People who do this in difficult environments should be applauded for making a positive choice which is not always rewarded by society. We made a similar choice when we lived in the UK and our children were small. 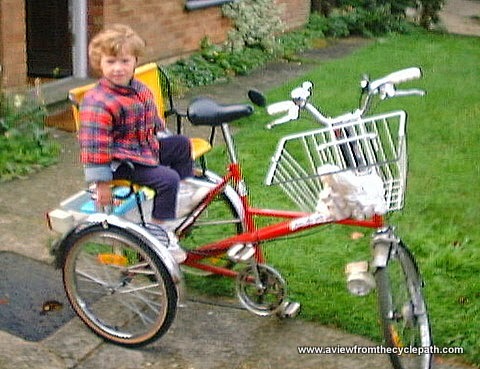 We first used a tricycle and later moved on to trailerbikes (also uncommon in the Netherlands for the same reason). It was not always easy to do this because other parents could be quite critical and drivers were sometimes quite aggressive around our children. Amsterdam has the lowest rate of cycling to school of any city in the Netherlands, closely followed by Den Haag and Rotterdam. Groningen has a marvellous centre, but hostile cycling conditions can be found a short distance north from the centre. Assen is also not perfect. In particular, a new dangerous junction south of the city centre makes access difficult for vulnerable people and recently there have been several design mistakes made in new infrastructure. The Netherlands is still far and away the most successful country on earth at encouraging people to cycle, and at encouraging people to let their children cycle. Assen is a stand-out city even within the Netherlands. But I always warn that you should never assume that this country always gets everything right. A truly high cycling modal share requires that everyone should be able to cycle everywhere. That is what true mass cycling is all about. Why do cyclists fear being banned from busy roads ? Is it faster to cycle on roads than cycle-paths ? What really makes cycling safe and convenient for everyone ? which are away from motor vehicles. which people ride extremely quickly. A fear which is often expressed, especially in the UK but also in other countries with little cycling, is that adoption of Dutch style cycling infrastructure will somehow lead to people being forced off the road. It is usually assumed that the road is the efficient place to cycle and that being forced off the road will be a problem for keen cyclists. In fact, bicycles are at their fastest on specially built segregated infrastructure and on closed roads. If you don't believe me, try following this link, and also this one. problem to leave this road to the cars. There is nothing inherent about being on a road with cars which makes cycling efficient. In fact, it's quite the reverse. For example, it is only because cars exist that traffic lights were ever invented. When cyclists have to stop at traffic lights, this is because the route which they are using is used by, or crosses, a route for cars. The people who worry most about being banned also sometimes point at the Netherlands as being a place where cyclists have lost a right to ride on all roads. But how important is it to Dutch cyclists that they're not allowed to ride on every road ? then how do you feel about this sign ? Both result in cycling without cars. Where are the complaints in the Netherlands? Actually, it turns out that this is not important at all. What matters in practice is that cyclists have a high density grid of high quality efficient routes to use to get to all possible locations. It's not very important at all that cyclists should go to the same places as cars can go to by following exactly the same routes. There's no reason to assume that the routes that cars are allowed to use are also the best routes for cyclists. Unravelling of cycle routes from driving routes means that cyclists don't have to put up with infrastructure which is necessary for cars and the inconvenience of sharing roads with cars is removed. In the Netherlands cyclists often don't have to stop for traffic lights precisely because they're not riding with cars. For example, in the city centre of Assen most streets are either not accessible by car, or have been made less useful by car than by bike. The result is very good conditions for cycling. Indeed, it's more efficient for cycling now than it used to be because getting rid of the cars meant that the many traffic lights which used to be present and which once delayed cyclists on city centre streets are no longer required. Through the countryside, country roads have been made unusable or un-attractive to drivers and here too there are many cycle-paths which take more direct routes. By making a distinction between cyclists and drivers, it's also possible for drivers to be built the sort of junctions that they need without cyclists needing to being aware of them at all. only for bikes. Much more like it. Why doesn't anyone complain about being banned from Motorways ? How effective is the law which requires cyclists not to use motorways ? I would say it's barely worth having that law at all. People are sufficiently unenthusiastic about cycling on motorways that it is extremely rare that anyone does so, and the law is only part of the reason why people don't do so. It is so rare that people actually do ride their bikes on motorways that those who do this often end up on television. I've never heard of anyone fighting for the "right to ride" on motorways. than by car. It's not often so in the UK. In the UK, main roads are sometimes built with dual carriageways and these are often motorways in all but name. The same speed limit applies and traffic levels can be very high. The main difference between dual carriageways and motorways is that it's required that motorways have a parallel route for the banned slow vehicles (not just bikes, also tractors, low power motorbikes etc.). a touring cyclist in the UK. No vehicles are banned from dual carriageways so no parallel route has to be built. Despite the lack of an alternative route, cycling on dual carriageways is also almost unknown in the UK. That there is a law to ban people from cycling on motorways but not from dual carriageways is pretty much beside the point because few people cycle on either. In effect, dual carriageways and other busy roads already have a ban so far as most people are concerned. Cycling on such roads is so unpleasant that very few people care enough about their right to ride a bicycle in such conditions that they actually do so. When I lived in the UK I was one of those rare people who actually did ride on dual carriageways sometimes. I would generally plan my routes to avoid unpleasant roads but if they were the only efficient route to my destination, I'd use them. This wasn't because they were pleasant but because I had a lack of choice. However we have to recognise that even a short length of busy road may as well be a thousand miles so far as most people are concerned. Most people simply will not cycle in those conditions regardless of their right to do so. In the Netherlands I've never had a reason to ride on a road so unpleasant as those which I sometimes used quite frequently in the UK. 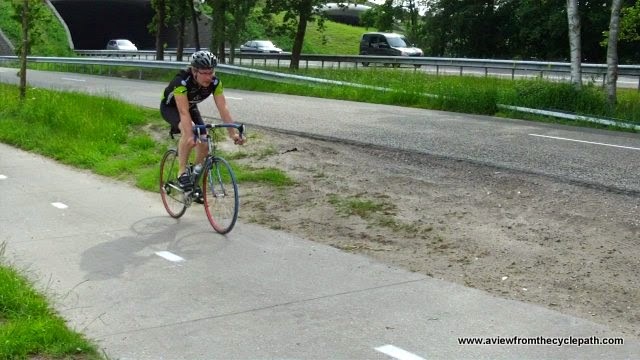 Just as the UK provides an alternative to motorways for slower vehicles, the Netherlands provides cyclists with alternatives to unpleasant roads. These alternatives very often take shorter routes and quite often combine that with more pleasant scenery. They can even have a better surface than the road. It's not a hardship to use these routes at all, this just makes cycling more pleasant. All types of cycling are incredibly popular in the Netherlands because all types of cycling are enabled by having a comprehensive grid of high quality infrastructure. While the cycle-paths are filled by commuters and children on Monday to Friday, Saturday is when you'll see any number of shoppers, Sunday mornings are when you'll see many racing cyclists and sunny Sunday afternoons are when the cycle-paths become especially filled by people of all ages just going out for a pleasant ride. Touring is incredibly popular in the Netherlands. It's a mainstream activity here, not something for a small minority, because it's accessible to everyone. Whether you ride long or short distances, fast or slow, it's all possible. If all cycling infrastructure in the Netherlands was as poor as that shown in the video this would indeed be a problem for cyclists. However, actually what is shown here is a rare exception: a cycle-path which is not of high enough quality to support a high and growing cycling modal share. It should have been replaced by something which meets current standards many years ago. Note again that this is absolutely not the norm. It's just a short bad section in one town. The rest of the grid is better and that's why cycling works. Ordinarily, we don't even have to behave like this even if there are road works. Note: Please don't make the mistake of assuming that the video above demonstrates the typical quality for cycle-paths in the Netherlands. The video above shows a cycle-path which is well below average quality. It is highlighted here in order to make the point that it is not good enough. Watch other videos which demonstrate normal quality paths on which it is possible to make very good progress by bike. Should cyclists be banned from roads ? Given infrastructure of high enough quality it actually doesn't matter terribly much if you can ride on the road because there is no advantage to riding on the road. When cycle-paths are more pleasant and more convenient than the roads, people simply don't opt to ride their bikes on the road. Not even fast cyclists. In the Netherlands, cycle-paths don't (usually) make people ride slowly. Even some very fast races occur on cycle-paths. When infrastructure is of this quality, a ban from riding on the road is academic. It makes no difference to anyone. In the Netherlands that is the point which has been reached very nearly almost everywhere. No-one designs different infrastructure for beginner drivers vs. experienced drivers because this would be ridiculous. It's just as ridiculous to design cycling infrastructure which is not good enough for all cyclists. If it doesn't work for a relatively fit and fast cyclist then it's not of good enough quality for beginners or children either. If that sounds unlikely, look at the video above a second time. Watch how when the infrastructure is too narrow even school children cause stress to the people who they overtake or who are coming in the opposite direction. Crashes and injuries are more likely for any cyclist wherever the infrastructure quality is lower than it should be. Wherever complaints are heard about "fast cyclists", it's usually an overly simplistic reaction to conditions which make cycling unsafe for everyone. cyclists have the same needs. High standards are important to achieve a high cycling modal share and a high degree of safety. Experienced and fast cyclists have nothing to fear from proper cycling infrastructure because their needs are actually the same as everyone else's needs. i.e. direct, comfortable and safe cycling. Cycling infrastructure which isn't good enough for everyone isn't good enough for anyone. I've lost count of how often people have tried to convince me that their city's streets are too narrow to have cycling infrastructure. The three words "not enough space" are repeated as if they are a mantra. 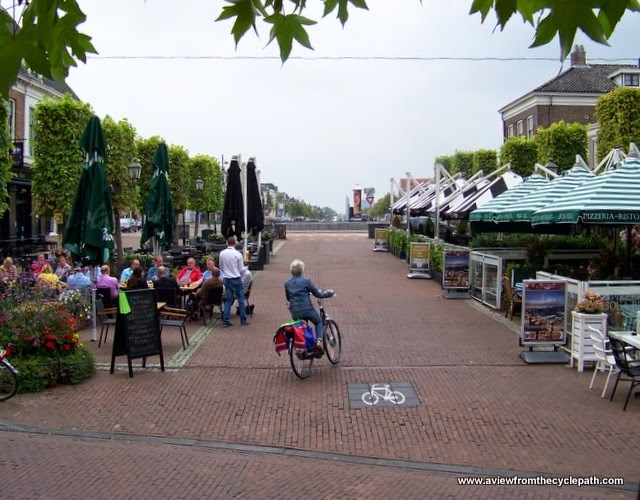 It is often genuinely believed that Dutch towns were built with wider streets and that there is therefore more space here than in other countries. Of course, that's not true at all. If you look around an older city like Assen (over 750 years old) then you find many narrow streets just as you would with any older city in another country. 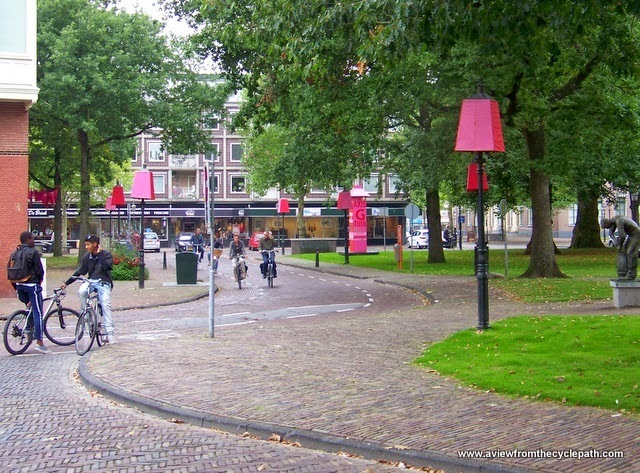 Newer wider streets in the Netherlands are also similar in width to newer wider streets elsewhere. It's the modern day usage of the space which is different, not the width of the streets themselves. Take a good look at the photo above which shows one of the streets in Assen in 2014. Quite clearly there's "not enough space" here now to accommodate motor vehicles. When people see streets like this then they often guess that there was never enough room and that therefore this street was always much as it is today. However, that's not actually the case. Look back to 1957 and we find that this same street was completely different. There was an asphalt through road in this location, and it was quite a busy road which could accommodate large vehicles in both directions. While the gap between those buildings looks small, it is in fact just enough to accommodate this traffic so long as you don't mind that pedestrians must cross only at certain places and can walk safely only on one side of the street. Note that no separate space at all was allocated for safe cycling. Cyclists had to use the road along with trucks, buses and cars. There is of course no longer a bus route through this location. 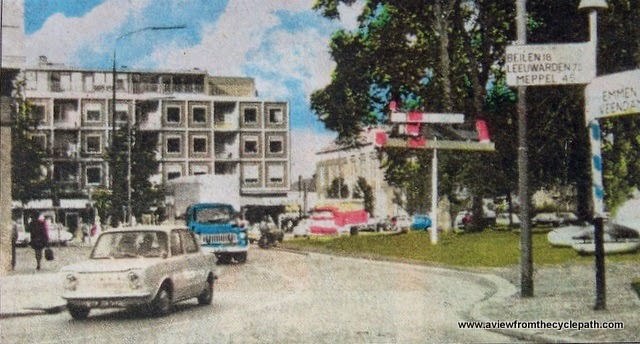 1970s city centre street in Assen. No room for cycle-paths here either. Traffic lights were required to deal with the cars in this location. Cyclists were amongst the cars and pedestrians had little space. I suspect that this is starting to sound like a familiar situation to some readers in other countries and it was certainly familiar to Dutch cyclists in the 1950s. The same location in 2014. We don't need traffic lights any more because cars are no longer driven through here. Note how there is ample space for cyclists on a "road" for bikes separate from a wide pedestrian path, and that the pedestrian path has plenty of space on both sides for a textured surface for blind pedestrians. An observer in the 1950s in the Netherlands might well have pointed out that this street had "not enough space" for a cycle-path at that time. i.e. exactly the same objection as people give about their streets now. 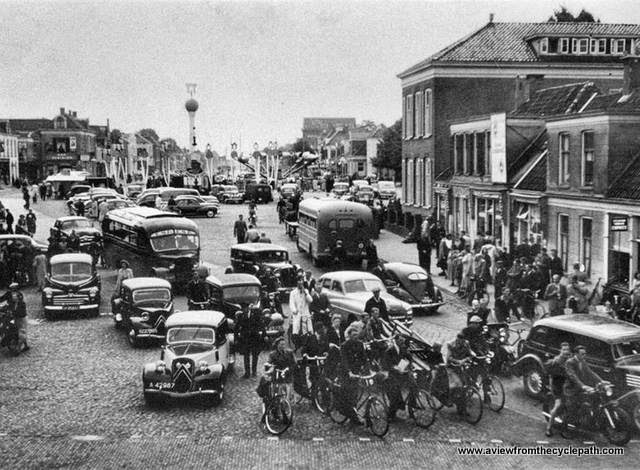 And of course they'd be right if the streets were viewed as having to always manage the same combination of vehicles as was the case in 1950s Assen. So where did the space for people, pedestrians and cyclists, come from ? It came from right underneath where motor vehicles used to be. A second revolution on Dutch streets was required to change things. A decision was made to effect real change. This was not limited to just a few streets, but spread across cities and even the entire nation. Traffic was redirected so that residential areas and the centres of cities could be reclaimed by people. It's worth reflecting on the fact that cycling was in decline in the Netherlands while streets were dominated by cars. It's not difficult to work out why. Transforming the streets reversed this decline. As you look at these photos, consider how convenient and how safe it was to cycle on the streets of Assen in the past vs. how convenient and safe it is today. Now (2014): Still accessible by motor vehicle but very much a downgraded route. No longer usable as a through route by car so therefore few people drive here. Still a busy through route by bicycle, which no longer requires traffic lights. 1940s: Major intersection, in this case busier than usual due to an event. Traffic stopped at a junction. 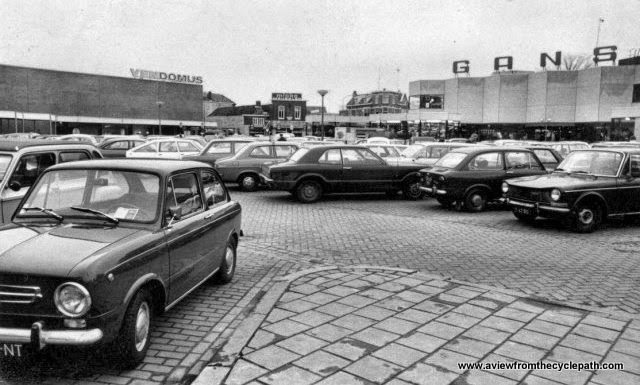 1974: Assen city centre was a car park. The car park was often full. Now: Assen city centre is a square with cycle parking and where events are held. There's no longer any need to have the streets leading to this area dominated by cars. Note that small children are free to cycle even in the city centre. People often believe that Dutch cities somehow have more space than other countries. As you can see from these photos, it's simply not true. 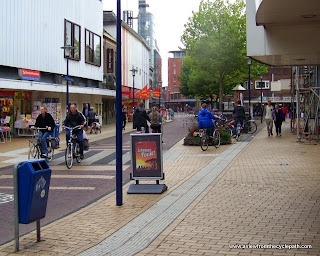 What happened in Assen and across the Netherlands was that planning on a large scale gave streets a defined purpose rather than all of them operating in a chaotic manner as through routes by car. Motor vehicles were not prioritized above all other transport but careful considerations were made of where they should go and where they should not. Busy roads still exist, but careful junction design removes conflict. Streets where cyclists and pedestrians needed to go were transformed to exclude through motor traffic. When ring roads were built the traffic was taken off the old main roads which became pleasant routes for bicycles. Crossings of the ring road were nearly always grade separated. 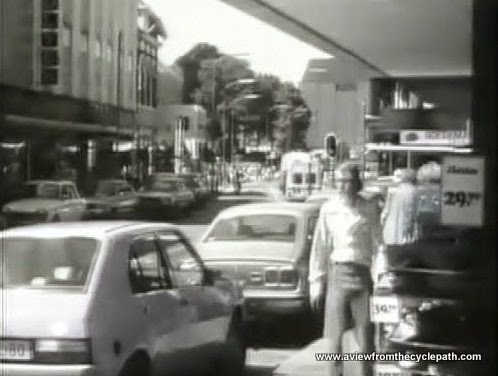 When a new route was required to take cyclists to the centre of a city from a new suburb, the original direct route was turned over to cyclists and the driving route took a required detour to traffic lights. Drivers are now kept away from the city centre by a special type of one-way system leaving what were once the busiest city centre streets to cyclists and pedestrians. A similar network of one-way streets is used in residential areas. Shops cater for cyclists with parking by the door, while car parks are by necessity larger and more remote. for access only by car. Together with an extensive grid of high quality cycle paths, these changes have resulted in nearly 100% segregation of cyclists from drivers. Cycling routes are largely unravelled from driving routes, resulting in lower noise, less danger and cyclists having the most direct routes and fastest journeys possible. This is what makes cycling extremely attractive to the entire population. Of course it's not just Assen but every Dutch city which has done this and they have all been successful. Nothing stops other countries from making similar changes. There is no better time for other countries to start a similar transformation than today. See the result of the transformation for yourself. We visit these locations on our study tours. 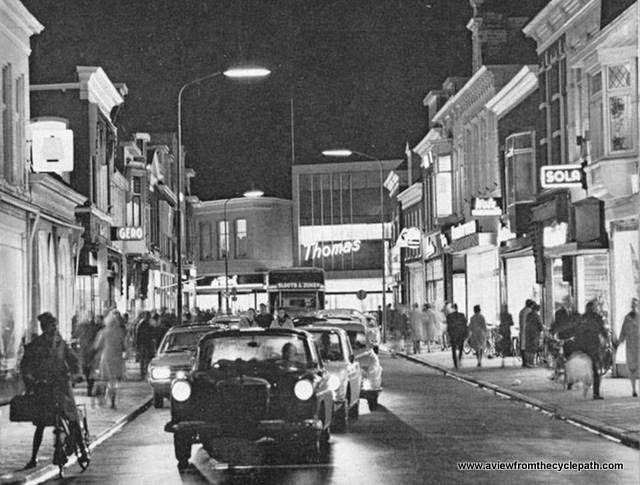 The city centre has changed enormously since this photo was taken in 1972. Infrastructure which was new or under construction at that time to accommodate endlessly more cars in the city centre was removed years ago.